Jore Equestrian Center is located on 320 acres of rolling hills and badlands in north-western North Dakota near the city of Williston. All our horses are allowed to run and graze in spacious pastures where they get plenty of exercise playing on the hills. While we have done almost everything on our horses from barrel racing to working cattle to trail riding in the mountains, our first love is Eventing: Dressage, Cross Country, and Stadium Jumping. 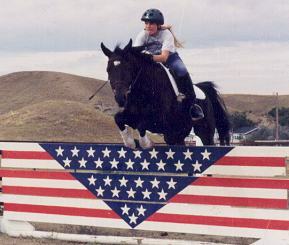 We are members of the United States Equestrian Association and we compete primarily in Montana, Wyoming, South Dakota and Canada. Our initial breeding program was Arabians and Pony crosses. We still have several Arabians, but because of our interest in Eventing, we have begun crossing the Arabians with Warmbloods, Thoroughbreds and Quarter Horses. The results are a very tough horse with added refinement and size. We love sharing the Eventing experience with others and do so through private lessons and riding camps, where we teach Natural Horsemanship.